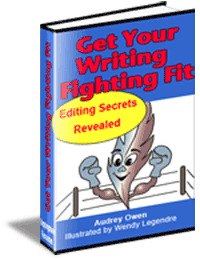 When you edit your writing, you have search out and destroy the words that don't serve a purpose. Yup... every one of 'em. Reading is a form of consumption, like drinking a glass of water or eating a sandwich. When done at the right pace, it's a very enjoyable experience. But when it's done too quickly, it gets very messy. As the wrier, it's your job to make sure you're feeding the reader edible bites. When you put too many extras on and try to force the reader to take it all in at the same time, he's going to miss something. Keep your sentences trimmed down to just the right amount, however, and the reader enjoys every last morsel of what you're feeding him. Anything that's off the topic or repeats what you've already said should be carefully trimmed out. The following table gives a few examples. Extra words make the sentence less powerful. The tiny bug slid right down the gaping drain. The average person finishes a book in 5 days.